The SpaceX Falcon 9 rocket that suffered a catastrophic explosion this morning, Thursday, Sept. 1, at Cape Canaveral Air Force Station in Florida was captured in stunning detail in a spectacular video recorded by my space journalist colleague at USLaunchReport. As seen in the still image above and the full video below, the rocket failure originated somewhere in the upper stage. Both the SpaceX rocket and the $200 million AMOS-6 Israeli commercial communications satellite payload were completely destroyed in the incident. Thankfully there were no injuries to anyone. This also marks the second time a Falcon 9 has exploded and will call into question the rocket's reliability. The first failure involved a catastrophic mid air explosion about two and a half minutes after liftoff, during a cargo resupply launch for NASA to the International Space Station on June 28, 2015 – and witnessed by this author. It took place during this morning's prelaunch preparations for a static hot fire test of the nine Merlin 1 D engines powering the Falcon 9 first stage when engineers were loading the liquid oxygen (LOX) and RP-1 kerosene propellants for the test, according to SpaceX CEO Elon Musk. 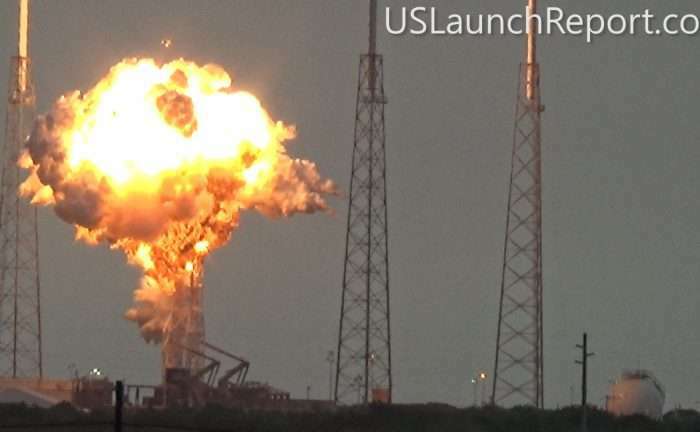 "Loss of Falcon vehicle today during propellant fill operation," tweeted SpaceX CEO and founder Elon Musk this afternoon a few hours after the launch pad explosion. "Originated around upper stage oxygen tank. Cause still unknown. More soon." The Falcon 9 explosion occurred at approximately 9:07 a.m. EDT this morning at the SpaceX launch facilities at Space Launch Complex 40 on Cape Canaveral Air Force Station, according to statements from SpaceX and the USAF 45th Space Wing Public Affairs office. All SpaceX launches will be placed on hold until a thorough investigation is conducted, the root cause is determined, and effective fixes and remedies are instituted. During the static fire test, which is a full launch dress rehearsal, the rocket is loaded with propellants and is held down at pad 40 while the engines are typically fired for a few seconds. The 229-foot-tall (70-meter) SpaceX Falcon 9 had been slated for an overnight blastoff on Saturday, September 3 at 3 a.m. from pad 40 with the AMOS-6 telecommunications satellite valued at some $200 million. In the video you can clearly see the intensely bright explosion flash near the top of the upper stage that quickly envelopes the entire rocket in a fireball, followed later by multiple loud bangs from the disaster echoing across and beyond the pad. Seconds later the nose cone and payload break away violently, falling away and crashing into the ground and generating a new round of loud explosions and fires and a vast plume of smoke rising up. At the end the rocket is quite visibly no longer standing. Only the strongback erector is still standing at pad 40. And both the strongback and the pad structure seems to have suffered significant damage. This would have been the 9th Falcon 9 launch of 2016.